There once was a little boy named Lambert. Colored like a lion, with a voice like a lamb, fur like a teddy bear, and shaped like, well, a little biscuit. Lambert, the Sheepish Lion, who turned out to be so brave, was the cat my family adopted from a shelter along with his mischievous, impish, orange and white brother, Loki, in March 2002. Such sweet boys, like apples and honey. Loki passed away last year, and Lambert left this world just last week. Their lives seem so short, but they were rich, and full, and spoiled. We could never keep a loaf of challah any place where Loki could get to it: he would rip the bag open with his paws and his teeth and chow down. And Lambert? Besides the eggs, the chicken, the (yes) steak he would beg for around our feet, that little cat loved his cheese. Two cats after my own heart. After I went home to New Jersey to bury him and say goodbye, all I wanted was comfort. I wanted something in his honor. Cheddar? Definitely. Pastry? Of course. Apples? Well, Lambert didn’t eat apples. 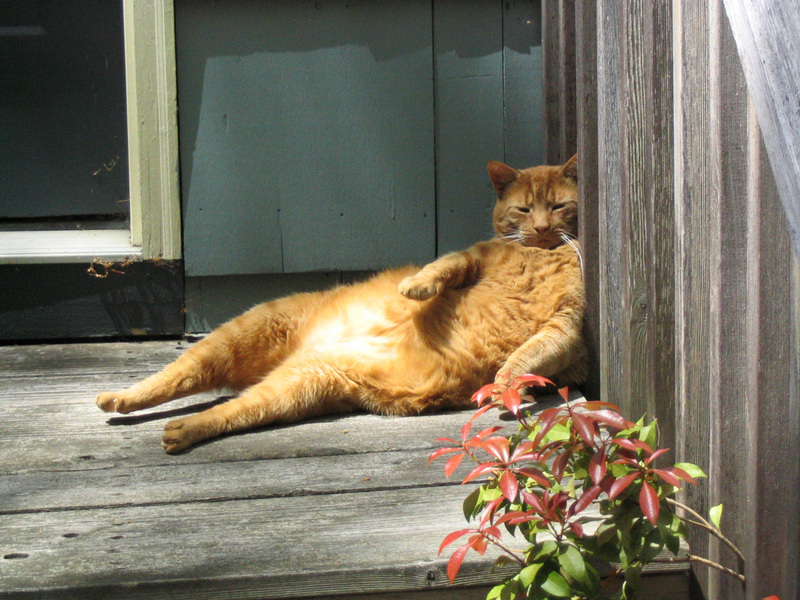 But the way autumn shone on him when he found a sunny spot to sleep or lounge in was stunning. He glowed. This was his season. These apple cheddar biscuits are for him. This was another “third time’s the charm” kind of experiment in the ImaginariYUM lab. 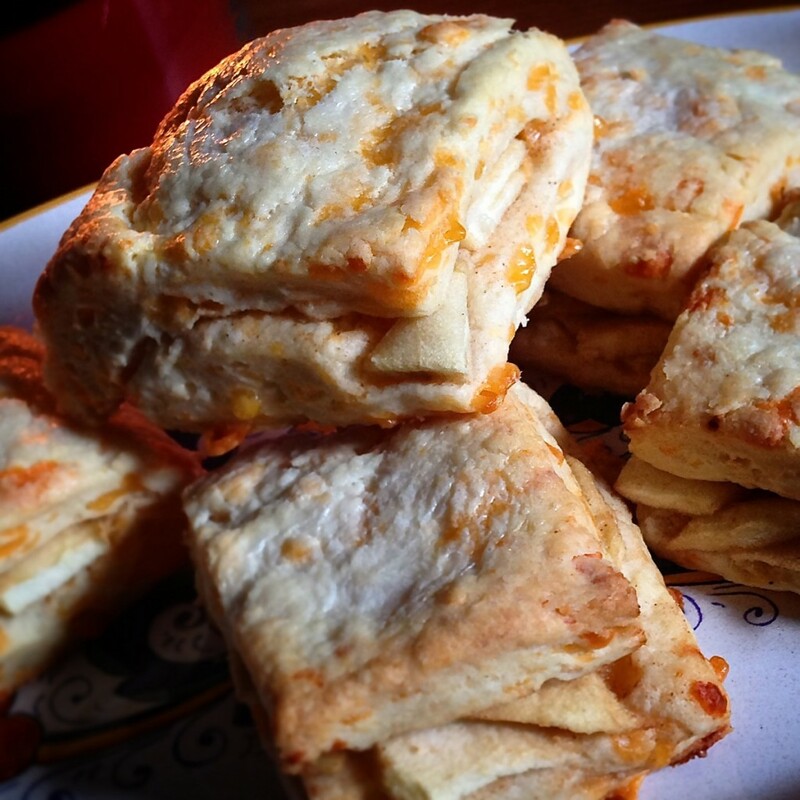 King Arthur Flour’s cheddar biscuit recipe – tall, light but rich, savory, and, with only three ingredients, absurdly easy – was my starting point. 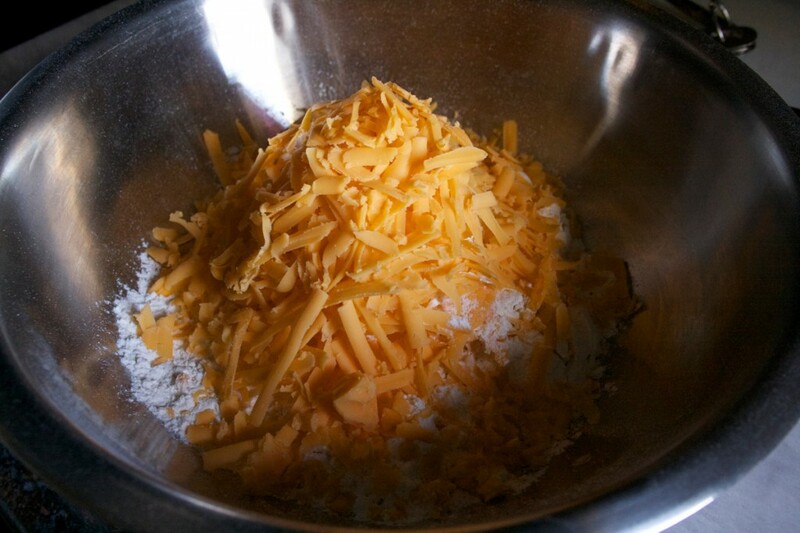 I began the experiment by grating one apple into the dough along with the grated cheddar. The biscuits baked up tall and delicious, but the apples melted into the dough, leaving a faint hint of sweetness but no discernible apple flavor. Next up, I turned to Joy the Baker’s apple pie biscuit recipe: the dough is folded over one sliced, lightly sautéed apple and cut into squares, making little apple biscuit sandwiches. 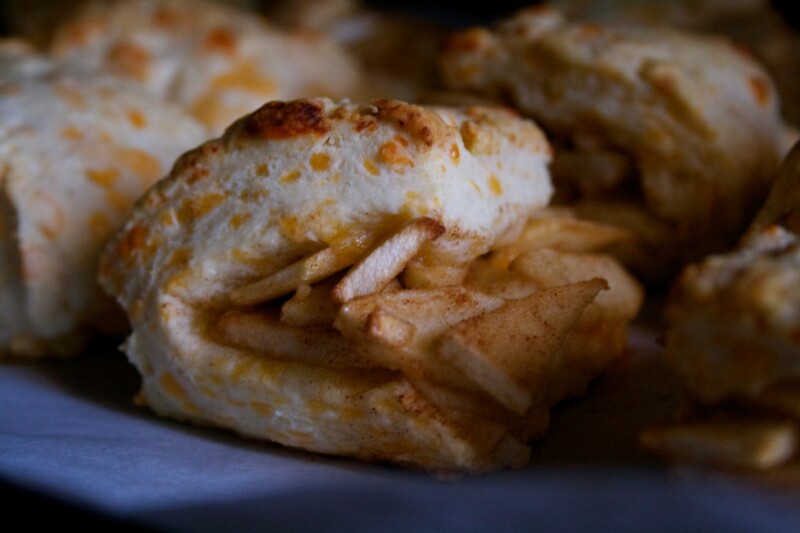 I switched out her rich buttermilk biscuit dough in favor of the cheddar dough and cut down the sugar and cinnamon. Amazing. Still, not quite right. The cheddar to apple ratio was just off: one thin slice of apple in each bite wasn’t quite enough to stand up to the strength of the extra sharp cheddar. I wanted more. It could be that the freshly picked, upstate New York orchard-fresh Macintosh apple I used was smaller than the Fuji Joy used in her beautiful recipe. But that’s what I had, so I was going to go for more – because that’s what Lambert would do. I peeled and sliced up two Macs, maybe eating some of the skin as I went along, sautéed them in two tablespoons of butter, a tablespoon of dark brown sugar and a tablespoon of honey, for the New Year and for Lambert’s dark and light stripes, a teaspoon of cinnamon and a healthy pinch of salt. Piled them over one half of my dough and messily folded it over. It wasn’t as pretty. It wasn’t going to all fit perfectly. Cut, brushed with cream, and baked for 15 minutes, and they were exactly what I wanted. Just the right balance of sweet and savory. Yes, the apples spilled out as the biscuit dough grew tall in the oven. But like little kitties that come home with scratches and broken legs, like kitties who hide in storm drains, like kitties who learn how to open doors, like kitties who keep you awake half the night purring in your arms – perfection is overrated. Like that round little guy, these biscuits have heart. They have sweetness, and they have character. Most of all, instead of crying thinking of the hole he’s leaving in our lives, they make me smile and laugh, remembering how he filled it. 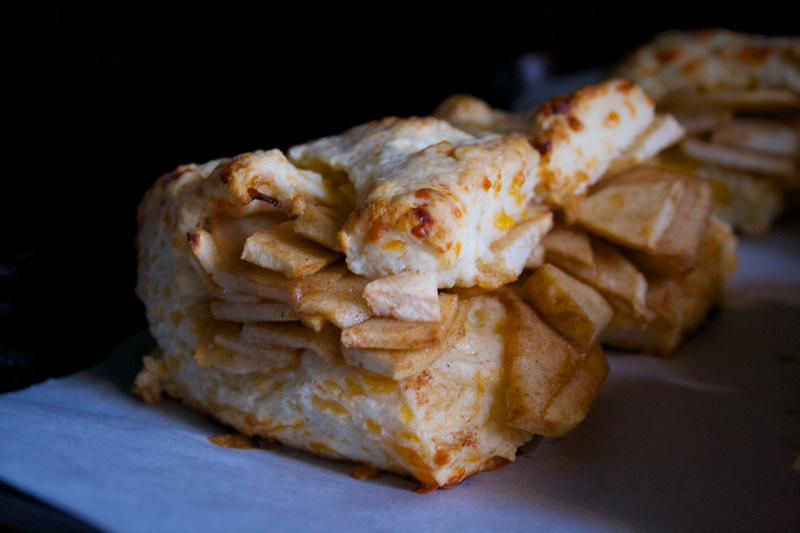 I love the complexity that sweet-tart apples, like Macs and Cortlands, lend to this recipe. You can go for a sweeter apple if you prefer, but stay away from those with a high water content, which will disintegrate when cooked. These apples maintain their shape, character, and slight firmness in this recipe, which is exactly what I wanted. 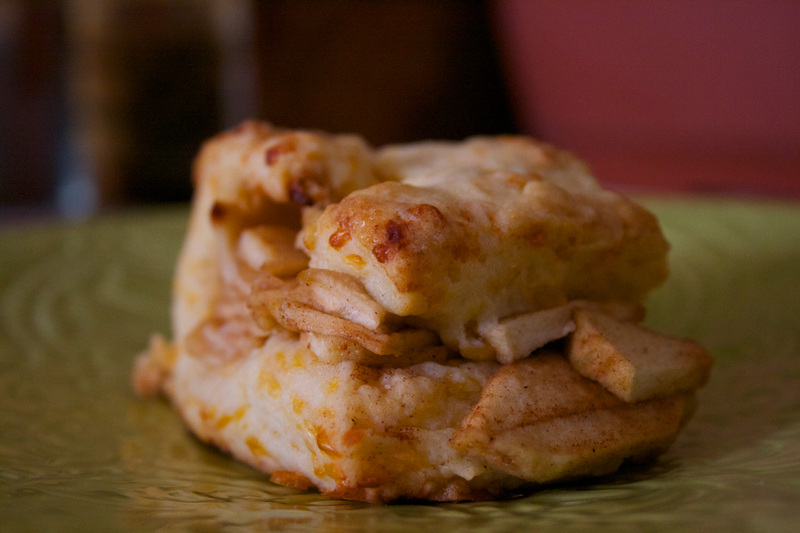 Plus, the tartness makes it easier to balance the sugar and keeps the biscuit a little more on the savory side. It dances beautifully with the cheddar. Note: This recipe uses King Arthur Flour’s Self-Rising Flour, which contains all the salt and leaveners you need for a fluffy pastry. I love it for its ease, but if you don’t have any, you can always amend by whisking together 2 cups less 2 tablespoons of all-purpose flour, 1 tablespoon of baking powder, and 1 teaspoon of salt. Preheat oven to 425 degrees, with a rack placed in the upper third. Line a baking sheet with parchment. Melt butter in a 10-inch skillet over medium heat. 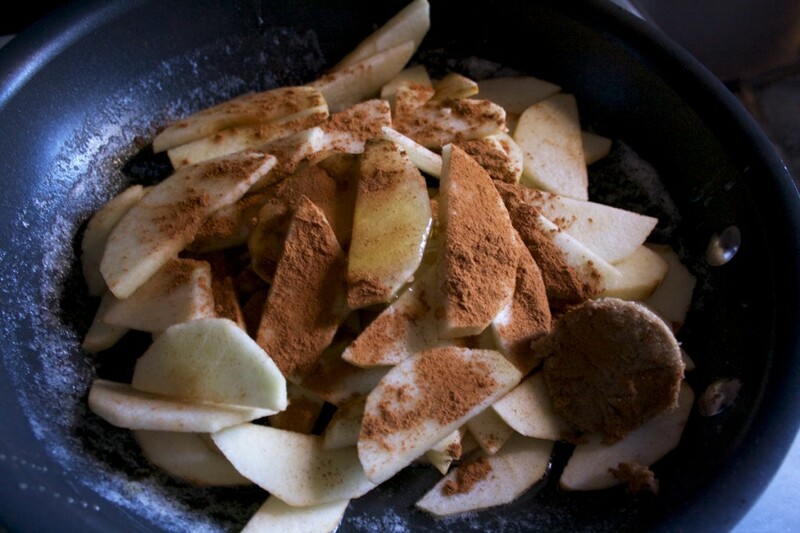 Add apples, brown sugar, honey, cinnamon, and salt, and cook for about two minutes, until the sugar has melted into the butter and glazed the apples. Set aside to cool. Dump your flour into a large bowl. Grate in cheddar and toss to coat. Add your cream and stir until dough begins to come together. Transfer to a clean, lightly floured work surface and gently knead the dough to incorporate any floury bits and form into a ball. 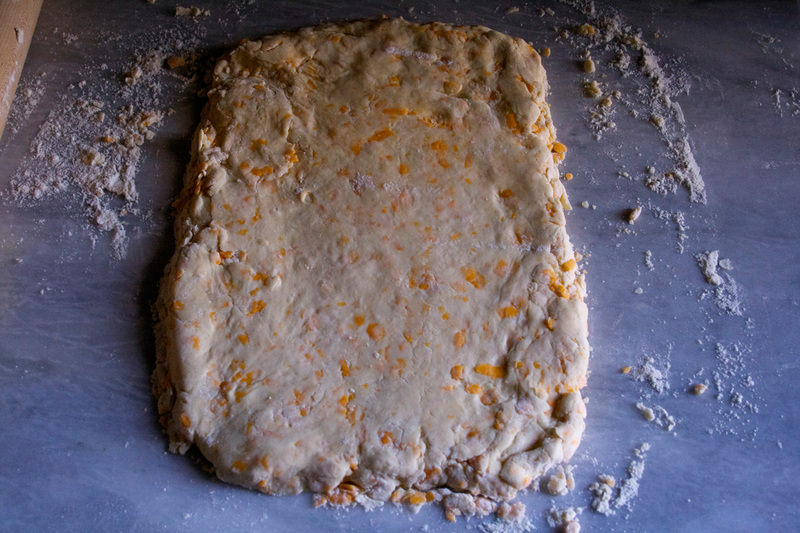 Pat into a rectangle, and with a rolling pin, gently roll out your dough until it measures approximately 8” x 10 “ (about ½-inch thick). 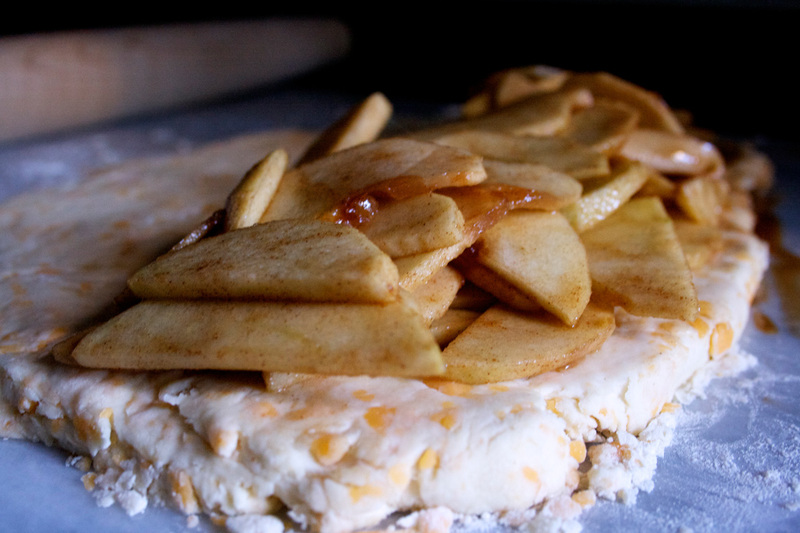 Transfer your cooled apple mixture onto half the dough, piling it along the long side. Fold the apple-less half of dough onto the appled side, and pinch seams to close. Gently pat your rectangle down until it measures approximately 6” x 8”, and straighten the edges as best you can. Using a sharp knife, cut your dough into 12 rectangles. Place on prepared baking sheet and brush with cream. Bake for 14-18 minutes, or until golden brown. Serve warm or at room temperature.